There's just something about this unlikely combination of Grapefruit and Mint that cheers the very soul. Sure to make your heart smile, this clean, uplifting blend is one of our best sellers. Pure Essential Oils of *Organic Grapefruit, *Organic Sweet Orange & *Organic Peppermint. 100% Plant-Fiber, Unbleached Wick. 16+Hour Burn. Grapefruit-Mint naturally changes from a creamy yellow color to a pale minty green as it oxidizes, due to the peppermint essential oil in its blend. No dyes. No synthetic fragrances. Each of our beautiful hand-poured soy aromatherapy candles features pure essential oils and cotton-fiber wicks for the cleanest scent delivery in a soot-free, biodegradable vegetable wax. Our candles take on frosted, pastel hues of the essential oils used in them, much like the natural beauty and variety of bird's eggs. 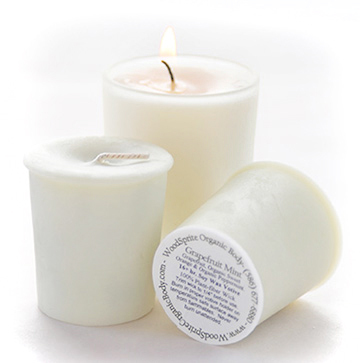 Votive candles are actually container candles and must be burned in a heat safe votive cup--never on a plate. Each tapered votive measures 1-3/4" in diameter at the top, 1-7/16" at the bottom and is 1-7/8" tall. Earn 6 Loyalty Points when you buy this item! Organic Body & Massage Oils - 4 oz.